Photo courtesy of Margin of Victory, a blog about boardgames. It covers the adventures of John and Russ at WBC 2009. That was quite a week. Have you recovered from your "vacation" yet? I'm just starting to return to normal, but there's no time to waste. WBC 2010 is only 50 weeks away. On with the show! Bruce Beard emerged as the new reigning master at WBC 2009 by holding serve to win his fifth straight 18XX title. He took over sole possession of the bragging rights for championship streaks when Steve Packwood (1776), Devin Flawd (Paydirt) and George Seary (Hammer of the Scots) failed to successfully defend their titles after strings of 6, 4 and 4 consecutive championships respectively. At the other end of the title spectrum, 32 players won their first WBC championship and 105 earned their first BPA laurels. 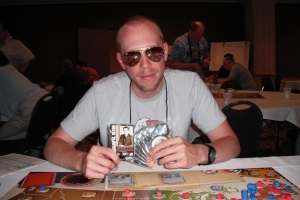 Fourteen won multiple titles, led by Kevin Wojtaszczyk who took three shields in Santa Fe Rails, Alhambra and War of the Ring. With the latter being a pre-con and not eligible for Consul laurels, it looks like a real horse race for Consul honors in 2009 with many legitimate contenders. Attendance was up for the convention as a whole and that was reflected in tournament participation as well with 17 events drawing triple-digit participation and the average attendance for the 151 events increasing 2.3 to 49.4, buoyed by 230 players for Dominion and 220 for Ticket to Ride. You'll find a preliminary list of 2009's champions below, to be followed in November by our detailed event report pages as only WBC does them. Next year's World Boardgaming Championships will be the 20th anniversary of this reunion of kindred spirits counting back to our roots in the original Avaloncon. We've come quite a ways against long odds, but the future is looking bright thanks to the efforts of over 100 volunteers who contribute their time in varying degrees as Board members, GMs, and behind the scenes workers submitting to a few simple rules to band together for the common good. The point is that we all own WBC and we get out of it only what we put into it. No one profits from this convention or gets paid to run events. We do what we do because we love our hobby and we want to give it substance. We are an organization of volunteers whose combined efforts are greater than the sum of its parts which is a fancy way of saying - here is what You can do to help make next year even better. Regardless of your busy schedule or state of lethargy, I challenge you to find something on the following list you can contribute to the betterment of the next WBC. 1. FEEDBACK: Did you run across an outstanding act of sportsmanship or a great GM performance this year? Tell us about it at doncon99@toad.net. From such unsolicited testimonials, we draw the nominees for our GM of the Year, Sportsmanship, and Hobby Service Awards. Reward good behavior - take a moment to single out those who should be applauded for their service. And conversely, if you had a bad experience with a GM that could benefit from some advice on how to better run their event, tell us about that too. GMs don't get better in a vacuum. They need feedback to consider how they can improve their events and their own performance. We share your input with them and allow you to do so anonymously. 2. SHARE YOUR EXPERIENCES: If you had a good time, don't be reluctant to tell others about it. We spend a lot advertising WBC on Boardgamegeek, but it isn't as effective as the many enthusiastic Geeklists that our members have authored since the convention ended relating the fun they had. Out of such testimonials, future gaming partners grow. 3. VOTE FOR NEW EVENTS: Simply by participating in events this year, you helped determine the 2010 Century lineup by pure head count. However, 25 new or "second-chance" events will be determined solely by membership vote in our annual December membership drive. By joining the BPA then you can influence the events that are offered next August. And as a bonus, you'll save money on the cost of registration and get a free full color 2009-2010 yearbook and souvenir t-shirt - items that were unavailable at any price to those who waited to pay at the door. Year 'round membership also gets you free admission to BPA email tournaments and discounts to our other conventions. 4. SUBSCRIBE: Even the most lethargic among you can handle this one. If you are not already receiving our free monthly email newsletters, go to the website address at the end of this message to subscribe and thereby be kept up to date on all the news pertaining to WBC as it happens. 5. PUSH THE ENVELOPE: Not content with the event offerings at WBC? Then do something about it! Our events are run because enough people want to play them, but also because someone got off their duff and volunteered. If you've already done #4 above, then you probably know that every October newsletter announces the call for new GMs to submit event forms for games not run at the previous WBC. Only by doing so in a timely manner, can these events appear on the membership ballot in time for the December membership drive. 6. VOLUNTEER: Want to get your feet wet before going all out to run an event yourself? Most events are in need of assistants to help sign people in, write event reports, or adjudicate games. Just contact the GM whose address appears beneath each event page on our site to offer your services. Most will gladly accept any and all help. Only when enough people help so that we don't have the same people pulling double and triple duty will there be any chance to actually increase the number of events at WBC - regardless of the attendance. Most of our GMs have been "giving back" to the hobby for years. They could use some help. Our next convention is EuroQuest VII in Timonium, MD Nov 12-15. Other upcoming events are WAM VIII: January 28-31, 2010 @ Holiday Inn, Timonium, MD; Enlightenment XIII: March 28-31, 2010 @ Holiday Inn, Timonium, MD; and WBC 2010: August 2-8, 2010 @ Lancaster Host, Lancaster, PA. Bold = Won more than one event at WBC 2009. Red = Won three events at WBC 2009. Last updated 8/19/09 by kae.